SILICON VALLEY, CA--(Marketwired - Jun 7, 2016) - Putting itself in a position to dramatically impact the notion of global sustainable energy, power semiconductor solutions company Semitrex today announced the opening of its London Integrated Design Center and its UK subsidiary Semitrex Integrated Semiconductors, Limited. The entity and facility enables Semitrex to expand its global presence and technology offerings, with the London-based design team focusing on the development of the reverse of the power supply process with an intelligent Inverter Supply System on a Chip (ISSoC™). Based on Semitrex's U.S.-developed award-winning capacitor-based power supply conversion technology, the new ISSoCs will help the UK reach its renewable energy goals recently mandated by the European Union (EU). Through its Renewable Energy Directive, the EU has set itself the target of producing 20 percent of its energy from renewable sources by 2020. Renewable energy is defined as energy generated from natural processes that are continuously replenished -- including sunlight, geothermal heat, wind, tides, water, and various forms of biomass. This energy cannot be exhausted and is constantly renewed. Each country in the EU has its own target to meet, and the UK has been asked to procure its percent of energy consumption from renewable sources by 2020. According to Michael H. Freeman, J.D., CEO/CTO for Semitrex, a new approach was lurking within the subset of the existing TRONIUM® Muxcapacitor® technology. "In order to address the EU mandate and the UK's need for more solar power, we are changing the paradigm. In the U.S., we are very focused on reducing energy consumption, and our core technology does just that with high voltage to low voltage power converters -- bringing efficiencies of over 90 percent and reducing standby power to less than a milliwatt. Based on my hunch, Semitrex engineers have now concluded that the polar opposite of the process -- an inverter, which takes low voltage DC and boosts it to high voltage AC -- is possible within our own existing capacitor topologies. This creates a highly efficient smart micro-inverter for renewable energy applications, which moves towards meeting the UK and EU's energy directive -- and will help rebuild the UK's semiconductor export market." The first comprehensive power conversion breakthrough in decades, Semitrex's core energy efficiency power supply technology products -- the TRONIUM Power Supply System(s) on a Chip® (PSSoC®) -- reduce voltage through capacitor banks instead of a transformer. The new London Integrated Design Center will be dedicated to developing the opposite of the existing process to create an ISSoC up-converter for solar applications, which shifts lower voltages to higher voltages with the same ultra high efficiency and miniscule power stand-by draw through cascading capacitor banks. 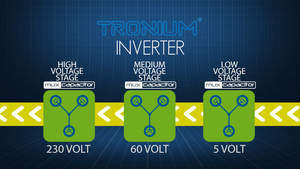 Now, Semitrex will produce power inverters as well as power converters. The ISSoC is a first-of-kind product that addresses a blind spot in current transformer-based inverters, which have extremely low efficiencies at low currents (such as a solar inverter on a cloudy day). Semitrex's new ISSoC will maintain 97 percent efficiencies across all current loads. This is well beyond the five percent guidelines set by the EU and is set to significantly increase the efficiency of renewable energies. Please visit www.semitrex.com for more information. Semitrex is a new breed of power semiconductor company enjoying successes in energy-efficient digital power solutions. At a time when worldwide energy shortages are a reality and strict new efficiency standards are being enacted globally, Semitrex is creating impactful, revolutionary energy-efficient power conversion products that are friendly to humans and the environment. The first real power supply breakthrough in over four decades, Semitrex's highly energy-efficient TRONIUM® Power Supply System on a Chip® (PSSoC®) is a total solution that virtually eliminates vampire power losses. Applications addressed by Semitrex's power conversion technology include the billions of devices in the consumer, computer, telecom, medical and industrial markets. To learn more about Semitrex, please visit the company website at www.semitrex.com. The TRONIUM Solar Micro-Inverter from Semitrex processes 5v into 230V in a single silicon chip for the highest ever efficiencies. Semitrex's intelligent Inverter Supply System on a Chip (ISSoC) addresses a blind spot in current transformer-based inverters. The Semitrex ISSoC maintains 97% efficiencies across all current loads, which is well beyond the 5% guidelines set by the EU.